While many gardens fade after mid-August, mine often looks better in September than it does at other times of the year. It’s not something I’ve planned, but a happy accident of having a few fall bloomers, annuals that don’t take off in Minnesota until mid to late summer, and early bloomers that make an encore appearance in September. This clematis bloom, for instance, was a complete surprise. I bought this ‘Bee’s Jubilee’ clematis at Donahue’s Greenhouse in Faribault way back in May. Since it was its first year in the ground, I did not expect blooms at all. But yesterday while out picking my ga-zillionth raspberry, I noticed it, peeking around the pergola. It’s very pale and pretty and I’m looking forward to seeing more next year. Bee’s Jubilee clematis blooms again in September. In addition to the surprise clematis, I’ve getting another flush of bloom on my roses out front (this grasshopper posed nicely on a bloom, though grasshoppers are not my favorite part of September), some daylilies are putting on a last show, a few Goldmound spirea are sprouting their second round of blooms, buckets of zinnias and cosmos are still looking good, and that’s in addition to all the lovely fall plants such as Autumn Joy sedum, black-eyed Susan, and a gorgeous Joe Pye weed that is attracting bees from all over town to my meadow area. 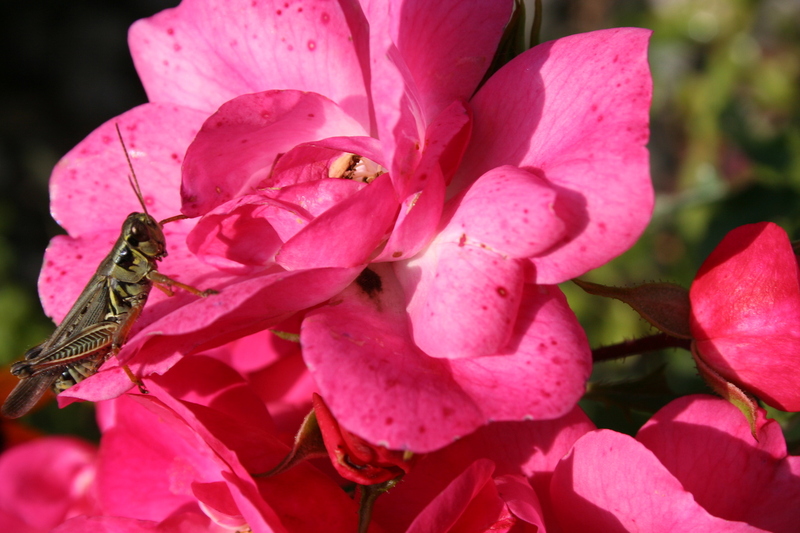 The grasshopper liked this rose as much as I did. That’s not to say some areas are not looking a little — umm, let’s say, tattered. The beautiful hollyhocks from early this summer are faded, ratty and begging to be cut down (it’s on the weekend chore list), and some tall rudbeckias I planted last fall are in deep lean mode now. And, of course, the Grandpa Ott’s morning glories have taken over big swaths of one bed (pulling those before they seed is another job on the weekend list). I just heard an unofficial weather report that the warmth of the past week will not last much longer, so now is a good time to get out and appreciate the garden’s last blast of beauty. 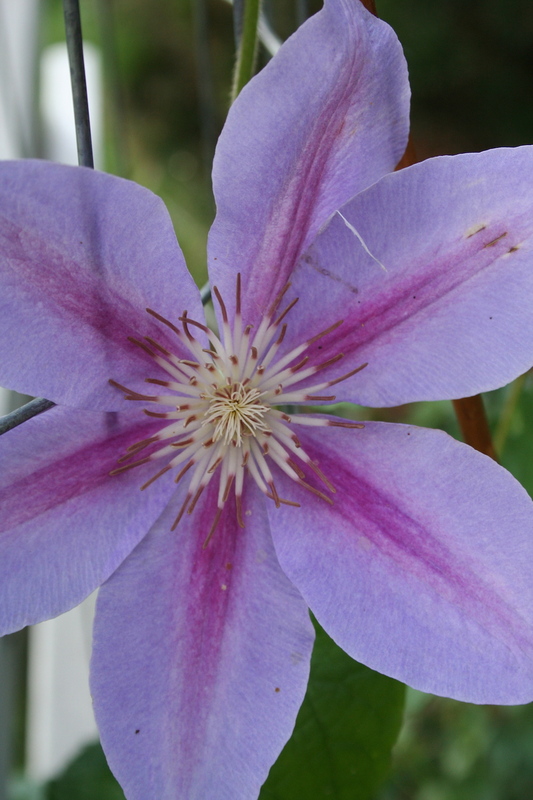 Oh I love the color of your ‘Bee’s Jubilee’ Clematis! In my harsh northern (Montana) garden, the most reliable Clematis is ‘Jackmani’ in it’s dark purple, so I crave Clematis in other colors.